We welcome all comers to celebrate a decade of music from local misfits and chancers The Eastern on Saturday December 10th for an outdoor festival style concert at The Tannery, Woolston, Christchurch. The stage will be in the parking lot right out front of The Brewery and Blue Smoke. Alongside food stalls & cold beers there will be hours of family friendly musical entertainment in celebration of New Zealand’s hardest working band. 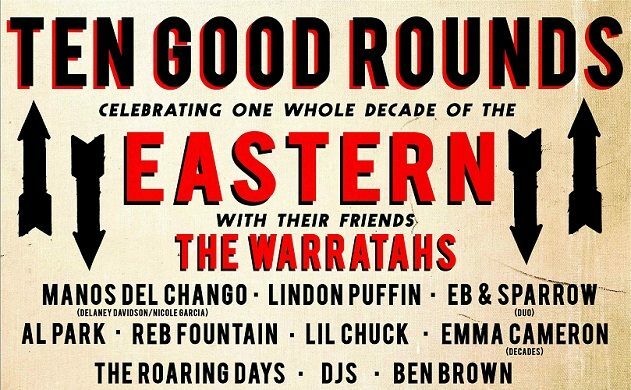 Featuring performances from The Warratahs, Manos del Chango (Delaney Davidson & Nicole Garcia), Lindon Puffin, Reb Fountain, Eb & Sparrow, Al Park, Ben Brown, Lil’ Chuck, Emma Cameron & The Roaring Days; live music begins at 3pm and culminates in The Eastern taking the stage at sundown. All profits will be donated to The Christchurch City Mission. Entry is $20 + a non perishable food item. Children under 13 are free. Pre-sale tickets are encouraged as space will be limited.